This column ran in The Lebanon Democrat, October 20, 2015. It remains one of my favorite stories. 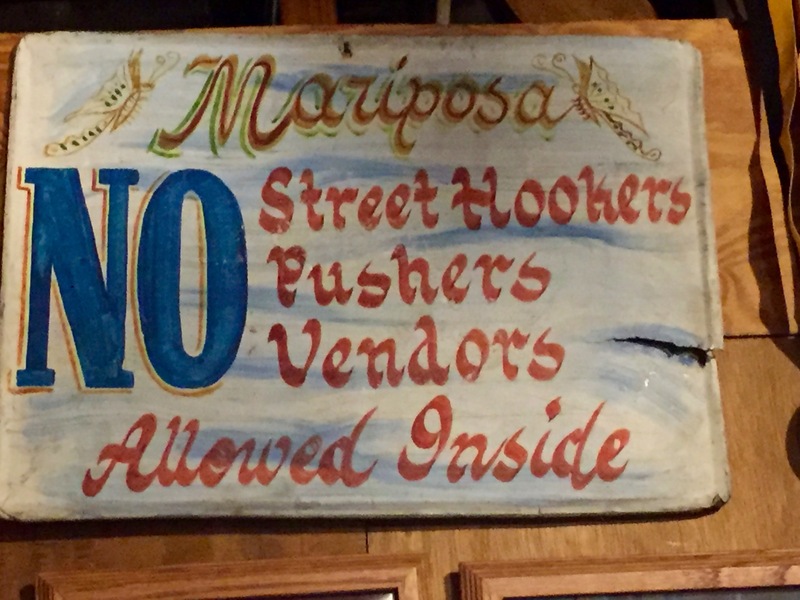 SAN DIEGO – If this story has been told here before, I apologize, but if it was here, it appeared a long time ago, and my filing system, such as it is, shows no mention. Over a decade ago, my friend Jimmy Gamble sent me a letter containing an old sports article. I scanned the story and emailed it to a number of people. Marty Linville, one of my Friday morning golf buddies, responded. Marty, who played football at Pittsburg State in Kansas (the Gorillas won the NCAA Division II championship in 2011, added a play-by-play description of one touchdown. I believe that email exchange is the only time I wrote about this incident. Regardless, it is a great story and good for my ego. Jimmy Gamble, who sent the original letter is now retired from the defense industry and lives in Huntsville. He became my close friend when his family moved to Lebanon in 1956. His father Barney became one of the most respected and longest termed principals in Lebanon. Jimmy and I played football and basketball together from our first year at Lebanon Junior High School until graduating from Castle Heights in 1962. We went to church together and ran around town in his used Renault Dauphine, one of the earliest models. In our final years at Heights, Jimmy and I dreamed of getting football scholarships to Michigan together. Of course, it was a pipe dream. Jimmy and I played our last football with the 1962 Mid-South Champion Tigers. There were some low spots in the middle, but we started and finished on high notes. Our first team’s success is well documented. 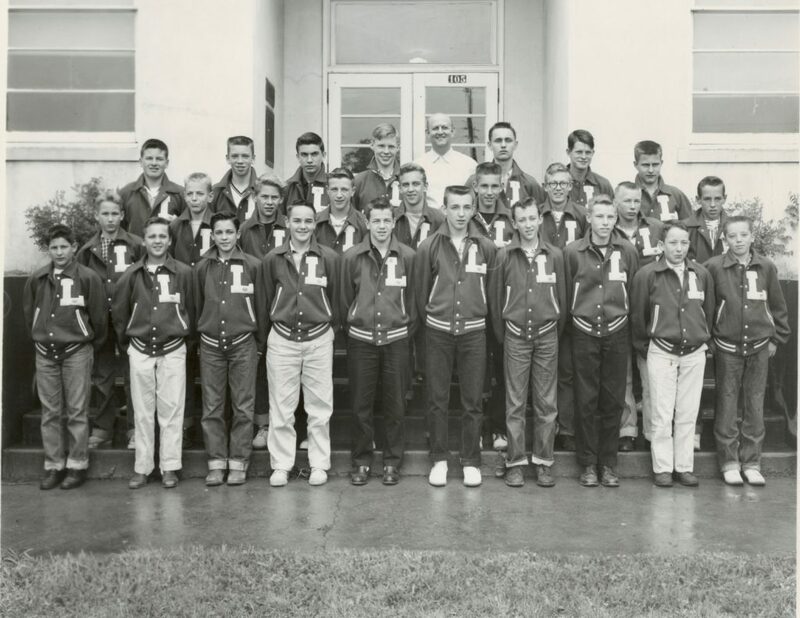 The 1956 Lebanon Junior High Colts ran the table for an 8-0 season in 1956 when Jimmy and I were subs and seventh graders. We finished on the 1961 Mid-South champion Castle Heights Tigers, with a 6-2 record. One of those losses was 6-0 to Furman (Va.) Junior College, ranked the number four junior college in the country. One of our successful seasons has been mostly overlooked. In our eighth grade year, the Colts posted a 7-1 record with a lone loss to Pulaski. That game was the first football contest we lost, the only one in our two years of junior high school. I don’t remember the score, but I do remember being devastated. I didn’t think it was possible to lose until then. I cried on the way back to our dressing room. Jimmy’s letter included a clipping that made the loss, almost a half-century earlier, less painful. The Democrat article described our Colts win over Shelbyville, 27-6. The game was played on a Thursday evening at Alumni Memorial Field, now the site of Sellars Funeral Home that was Lebanon High’s home field until the school moved across town to Harding Drive. That game was a high point for me. I scored my only touchdown in six years of playing organized football. I remember my feelings quite well. I was excited but sad because my father was in Atlanta at a Pontiac meeting and missed it. Little did I realize, he would never get the opportunity to see me score again (Ironically five years later at Heights, my mother missed the only home run I hit, and my father told her it made them even). But the article Jimmy sent revealed I had not only scored a touchdown, I set a record for yards covered on a punt return for a score, at any level of the sport. No one, no one, I boast, has ever run FOUR HUNDRED AND FORTY SEVEN yards on a punt return except me. My friend Marty described the run as a twisting, cutting back, reversing the field, slashing, stiff-arming run of Homeric proportion. Alas, I must confess, the Democrat had a slip up. The “447” yards described as my zenith in any sport was the product of a typo. An extra four had slipped from the linotype machine. My record was not a record. My only touchdown was only a 47-yard return, good but certainly not heroic. First Row: Bobby Buhler, Russell Witt, Don Shipper, Buddy Phillips, Jim Jewell, Jim Gamble, Bill Cowan, LeRoy Dowdy, Eddie Dedman, Jimmy Majors; Second Row: John Bradley, Bobby Byrd, Fred Andrews, Jimmy Patterson, Billy Jennings, Rob Eatherly, Paul Thomas, Jimmy Wright, Jimmy Mitchell; Third Row: Sam Moore, Mike Gannaway, Henry Harding, John Walker, assistant coach Miles McMillan, Townley Johnson, Malcolm Metcalf, Fred Croslin. i am experimenting with a new whateveryoucallit system, hoping it will make the posts better for you. But i remain technology challenged. So i hope it works. If not, i will once again call upon my friend, the multi-media astonishingly great Walker Hicks to help. i also have been reticent to post much of anything here lately. i could blame it on a number of things, but to be honest, i just haven’t quite felt like it. Oh, i’ve been doing some writing, but it has been it struck me to do so, not because i have had to write. So as i try to move forward and get my stuff in order, again and again and again as The Highwaymen once sang, i decided to post this old one. i don’t know where i actually posted this. It was a while ago. It may have been a long lost post. It could be, and i move in this direction, a Democrat column. but i don’t know and am not really interested in finding out. i just stumbled across it tonight. It struck some chords. i don’t know why but John Kennedy’s assassination kept coming up in my mind tonight. It was just over a month and 55 years ago. A long time. It reminded me of Nashville and Vanderbilt where, when walking back from class (yeh, i actually attended most of my classes, believe it or not) Winston Churchill’s nephew Charlie, a distinguished chap, came out of the Beta house and asked me and several others if we had heard the President had been shot. Kennedy had been shot and i gathered with the other Kappa Sigma brothers around the radio and listened until the news folks reported he was dead. Stunned. In disbelief. And somehow, that terrible moment in time put me in tune with the below post or column or whatever it was. This was written several years ago. It is always, always nostalgic for me when I visit home as I have this week (hence, no San Diego dateline). Thursday when I drove up the hill of Castle Heights Avenue, nostalgia whacked me in the face with a flat-bladed shovel. The tune I associate with alma maters came from the 1857 big hit, “Annie Lisle.” Written by H.S. Thompson of Boston, the lyrics were far from inspirational, telling of the demise of a young damsel, presumably of tuberculosis, or consumption as it was called back then. Yet the tune was picked up by scores of high schools and colleges for their alma mater. The most familiar lyrics were originally written for Vanderbilt in 1907 by Robert H. Vaughn, but I have heard those lyrics adapted for schools across the country, including my daughter’s high school, Bonita Vista, in the Southwest corner. But when I hear those words, I think of McFadden Auditorium reared against the sky. On my drive, I turned down Hill Street to be face-whacked by that nostalgia shovel again. More dirt and even a few houses had taken over the old Heights drill field. Although I missed most drill periods for athletics, the freshman and junior varsity football practice fields were part of the freshly tilled dirt as well. Thus far, the baseball diamond and football practice field have been spared from development mania, but there are large bushes occupying the former location of the visitors’ dugout, and the bushes and on the south end of the old field have extended to where home run distance to fenceless center field now would be about 300 feet, not forever like back when the Tigers were swinging away. Whack, whack went the nostalgia shovel. Some of the best moments of my life were spent on that football practice field and baseball diamond long, long ago. The next day, I drove to Vanderbilt to explore some possibilities I have had in mind for some time. The next shovel whack came when I tried to park. In my two-plus years there, cars were few and far between. A number of upper class-men had cars, but that was about it. Thinking plentiful parking would be next to the stadium, I drove to the west end of the campus. No spaces. I finally parked in Centennial Park and walked across West End to the campus. I believe Vanderbilt has shrunk over the last fifty years. I do not know if it’s the newer buildings, the additions and design pleasing modifications to old ones, or the trees have grown that much, but everything seems more compact than in 1962. Yep. Another whack of nostalgia. Of course, I did not take a campus map, and recalling where to go and how to get there was complicated by faulty memory and new obstacles. I eventually succeeded and accomplished my mission, but I observed the changes in detail. Perhaps the most obvious change was dress. The uniformity of madras shirt, khaki pants, and weejun loafers for males, and skirts and blouses for females had been replaced by another uniform approach: shorts, tee shirts, and flip flops. Friday, the fraternity house was fenced in, undergoing refurbishment. Whack went that old nostalgia shovel one more time. But in my meanderings through the first half of my visit, I felt the late summer rain on Thursday morning, I smelled the grass as I walked through Centennial Park and Don Fox Community Park, and I talked to people who were just as friendly and concerned as they were those years ago. There is a difference between those things here and in the Southwest corner. But there also are ca lot of things alike in both places. Some things never change, and that is a good thing. i wrote this for The Lebanon Democrat on the last day of 2007. It was my eleventh column for that successful and long lasting local paper. i chuckled when i read it before posting today. Change definitely continues, even the places and people i wrote about then have gone through many changes, including me. The troika of couples, Henry and Brenda, Eddie and Brenda, and Maureen and i are still intact. The restaurant at the Heights’ superintendent’s home has changed hands several times. i don’t know if Joe’s and my photos are still in the opposite corners of the south side dining area. Even the predictions about today in 2007 would make us laugh. The Southwest corner continues to grow amok. Lebanon, i’m sure, has also continued to grow and change. And unfortunately, my trips back to Lebanon have decreased significantly as i knew they would when my parents passed away. But you know what? i’ve lived in the Southwest corner continuously for thirty-three years, it is our home. But Lebanon will always be my home. Tennessee in general and Lebanon in particular is not only a Christmas escape for me; it is a place to reflect on change. This year, the change, past, present, and future, seems more palpable. Often, we refuse to accept change as inevitable. We spend post-Christmas creating New Year Resolutions, which we usually blow off in a week or so. Just before Christmas, my wife and I shared a dinner at the Chop House with special folks. Change joined us for the evening. Growing up, I spent almost as much time at the home of Henry Harding; his maternal grandparents, J. J. and Maude Arnold; and his parents, George and Virginia Harding, as I did at my own home. Henry remains my “best” friend. He and his wife Brenda joined us. The couple’s troika was completed by Eddie and Brenda Callis. Eddie has been a close friend since we met in high school as sports competitors from Castle Heights and Lebanon High School. Brenda’s father, Jim Horn Hankins, recruited my father to work for at Hankins and Smith Motor Company in 1939, and they became partners in the late 1950’s. So Brenda and I have known each other pretty much all of our lives. We spoke of families, children, grandchildren, and parents. We spoke of friends. We spoke of adventures growing up and shared stories of places we have been. Essentially we talked about change. We talked amidst change itself. My sister, Martha Duff, had played in this structure, now the Chop House, with her friend Kay Lucas, when it was the Castle Heights superintendent’s home, and Ralph Lucas served in that position. Down the road, my mother played with the son of the original occupants of the Mitchell House, which Danny Evins so graciously renovated for Cracker Barrel’s headquarters. Further down on the original Castle Heights Avenue is the house my parents bought in 1942 when it was one of only two or three houses on the street and where they lived for sixty-one years. On the dining area wall hung a picture of my brother, Joe, attired in a Heights jersey. A photo of me at the 1962 graduation dance hung in the opposite quarter. The placement was appropriate. Joe and I always seem to end up in opposite corners even in choice of homes: Joe in Vermont, me in the Southwest corner. We often reflect on how we have managed change differently. At my age, change seems more important. I long for what used to be, overlooking the negative aspects of the past. The past seems more poignant. The need to share memories with my family, especially the new grandson, is strong. Change is never what we expect it to be. The 1950’s predictions for the next century are comical looking at them from this end. Sometimes change is better than expected. Sometimes change is worse. Growth, i.e. change, in Middle Tennessee is small compared to San Diego. A community of 100,000 has grown up about three miles south of our home since a large ranch estate was settled in 1995. The expansion of developments may soon extend to the Cleveland National Forest to the east. The increase in population has produced traffic congestion. Water supply is more tenuous than ever. Utility rates have risen dramatically. Housing costs are astronomical. Politics has become more profitable and more divisive. The plus side is convenience in shopping and dining. The developments are rife with parks, walking trails, nearby modern schools, and an increase in services. When I see change in Lebanon, I winch with concern it may drive away many of the things in Lebanon I hold dear. However, it seems to me Lebanon has managed change pretty well since I left for the Navy in 1967. Good change without destruction of the past appears to have been the rule. Dining with my life-long friends, it occurred to me they (and you folks who live here) have permanent connection to the past, which might explain the change management of the community. The sense of community is not strong in the Southwest corner. Change seems more precocious, more uncontrollable there. Before this article is published, I will be back in the Southwest corner, attempting to manage change positively. If all goes well, I will return to Middle Tennessee several times in the next twelve months and find change continues to be positive here. It’s a nice place to come home to. I hope that never changes. SW Notes 012: Why Navy? i have probably posted this before, but i don’t care. How i ended up with a Navy career still amazes me. Since i realized i was not going to be a sports star or even extend my sports past high school, i wanted to be a writer. The Navy was a choice for the matter of convenience. But looking back, it was a wonderful choice and shaped my life. i am proud of my choice. So here it is again. SAN DIEGO – As the new year ramps up, I am back in the Southwest corner considering why I made the Navy my career. My father also has wondered why a boy from Middle Tennessee would choose the sea for his livelihood. Others have wondered the same thing. The sea called me during my midshipman cruise on the U.S.S. Lloyd Thomas (DD 764) in 1963. We steamed from Newport, RI, to Sydney, Nova Scotia; to Bermuda; and back to Newport as part of the U.S.S. Intrepid (CVA 11) battle group. My last four weeks were in engineering with two watches and normal work requiring 16-hour work days. Having no more sense than now, I went from my last watch to the crew’s movie in the Drone Anti-Submarine Helicopter (DASH) hangar – “DASH” was a weapon which did not last long. Sailors called it “CRASH” instead of “DASH.” But its hanger on the 01 level just aft of amidships was perfect for showing movies. This night, I watched “The Quiet Man” for the first time. As I left the theater and traversed the torpedo deck, I walked to the port side and gazed at the full moon. The ship was making 15 knots. The moon’s reflection cut a wide, rippling, reflective path straight to me. The boilers roared through the forward stack. The bow wave was white, curling from the side and swishing its whisper as the ship cut through the water. “Darken ship” allowed no lights except those for navigation. At least a billion stars blanketed the black sky. The sea grabbed me. She came down that path from the full moon, wafted across the bow wave, and reached deep inside. I felt her grab my heart and take it away. I have loved her in her fury of the winter Atlantic, when she tossed a 500-foot ship around like a cork, ripping off protruding metal like dandelion bristles, and tossing sailors around the ship like matchsticks. Her intense fury blanketed the sea surface with froth. I have loved her in the doldrums of the South China Sea where not a breath of wind existed, and the sea surface was glass for a week. I saw my first “green flash” then. In the summer of 1973, steaming in the operating areas off of Newport, Rhode Island, my father saw why I went to sea. My ship, the U.S.S. Luce (DLG 7), was undergoing a major inspection. My Commanding Officer learned of my father visiting and invited him to ride during our underway day. As a lieutenant, I was the sea detail officer of the deck. My father was by my side as I had the “conn” while the ship stood out of Narragansett Bay. As soon as we reached the operating area, we went to 25 knots for rudder tests, rapidly shifting the rudder to max angles both ways. The commanding officer and I went into a frantic dance, running in opposite directions across the bridge to hang over each wing checking for small craft in the dramatic turns. After the rudder tests, I took my father into the bowels of the ship to our anti-submarine warfare spaces. My father stood behind me as I directed prosecution of a submarine contact. In the darkened spaces with sonar pings resounding, he watched as we tracked the sub on our fire control screen and simulated firing a torpedo. After lunch, we set general quarters and ran through engineering drills. Finally, we transited back to Newport. I did. Somewhere in the latter stages of that career, I met a woman, a native of San Diego, and we got married. 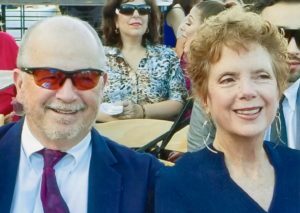 After a brief taste of being a Navy officer’s wife, she and I returned to San Diego for my “twilight” tour, the last four years on shore duty. So now when I walk up our hill to raise and lower the flag, I look out to sea and check to see how many ships are pierside at the Naval Station. And that, my friends, is why I made the Navy career and live in the Southwest corner, far from my home in Tennessee. This was one of my very first columns for The Lebanon Democrat. It is special to me because the man i wrote about here is very special to me. i wrote it right after the bad San Diego wildfires in 2007. Dave remains a wonderful, actually amazing man, and i am proud to call him my friend. For some reason last night while watching the woeful San Diego Padres lose again, something Dave said to me popped into my brain. Something Dave said during our time together or wrote in his book keeps popping into my head. That’s a good thing. If i remember correctly, this pop up was how his North Vietnam interrogators kept wanting to know where they kept all the cows, pigs, and chickens to feed the crew on an aircraft carrier. Regardless, i wanted you, in case you missed it before, learn a little bit about an American hero. 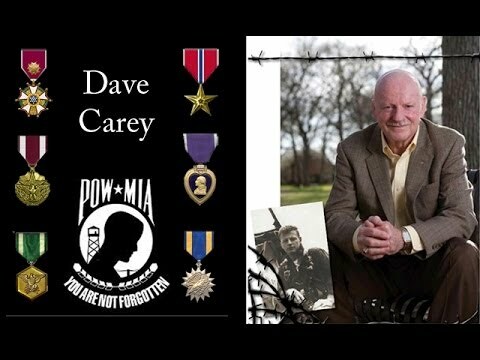 If you want to learn more about his story, his book, The Ways We Choose: Lessons For Life From a POW’s Experience is available on Amazon, Barnes and Noble, and i believe you can still get one from his website, www.DaveCarey.com. If all else fails, contact me. We will get you one if you want it. SAN DIEGO, CALIFORNIA – This past Monday, I left the cleanup from the San Diego fires and flew to Lake Tahoe, Nevada. It was not an escape. It was work. I was co-facilitating a team building workshop for a California police department with my friend, Dave Carey. Dave and I met in 1985 at the Naval Amphibious School in Coronado. We worked together for just shy of a year as I transitioned into Dave’s position as the head of leadership training for the West Coast and Pacific Rim. Together, we help create a two-day workshop on leadership excellence for senior Navy officers. Dave retired. Four years later in 1989, I followed suit. After my initial dive into my new job as Mister Mom, I soon started to look for ways to generate income in the quiet hours. After some discussion, Dave and I agreed I would write a book about his POW experience, or more accurately, about his motivational speeches concerning his experience. After completing the draft, we decided it really should be written in first person. The original draft is on my office bookshelf. Eight years later, Dave holed up for three weeks and completed The Ways We Choose: Lessons For Life From a POW’s Experience. Part of my approach to writing was generated from conversations with Dave. He and I were driving to another workshop about fifteen years ago when I asked him about what outcome did he expect the audience to have when he gave a speech. I don’t know about you, but I’ve managed to get shot down several times. Dave’s book and his ideas have been significant guides to me as I have wandered through living. The book not only applies to San Diego, Lake Tahoe, and Middle Tennessee; it worked in the Hanoi over 40 years ago. Dave’s book revolves around a question he is most frequently asked, which is, “How did you do that? How did you and the other POW’s get through that?” He maintains they did that in a similar way to how we get through our daily process of life and work. His anecdotes relating to those factors are humorous, inspiring, and thought provoking. I have had the wonderful opportunity to discuss these things in depth with Dave. So I check myself against his factors almost daily. They have even become part of the value statements for my consulting group. I will not ruin the book by parroting it here. However, I am particularly fond of Dave’s pointing out how the POW’s trusted each one of them would do the best they could, would resist the severe interrogations to their limit; recognizing each of them had their own limit levels. I now try to consider folks I work with are doing the best they can do. This puts a whole different shape to the way I work with these people. Fewer rocks are thrown; fewer lines are drawn in the sand; fewer chips are put on shoulders. I would encourage everyone to read’s Dave’s book. Your connections should be yours, not mine, not Dave’s. I know folks in Middle Tennessee also get shot down every once in a while. i should note here that bit about my consulting group is no longer extant. i write. i used to drive ships. i gave up consulting when i got tired of trying to make people do the right thing. i still follow Dave’s advice. One of my favorite stories about Lebanon. Oh the unbridled energy i had, digging graves and mowing until knockoff, running to get in my uniform to play fast pitch softball for Texas Boot Company or American Legion baseball and doing it all again for four days in a row with Friday night off. In the column, i omitted that Mr. Martin, i think John, was the manager of the water plant out by the river on Hunter’s Point Pike. i also erred in my time of employment. i worked at the water works for about three weeks and then went to Cedar Grove in 1958. This column ran in The Lebanon Democrat in the winter of 2010. The son of Mr. Bill sent me an email. i am looking unsuccessfully thus far, but when i find it, i will add that information about this column and this post. SAN DIEGO – A story by J.R. Lind about vandalism in a Cedar Forest cemetery ran last week in The Democrat. The vandal’s motive for digging into a grave was unclear. The story also brought memories. In 1958, I started summer work with the City of Lebanon. After several early assignments, I worked at the water works on Hunter’s Point Pike with Truman Garrett and Elmer Elkins. The following summer I hoped to drive a bush hog tractor but was told I was too small. My big friends, Henry Harding, Charles “Fox” Dedman, and others were assigned the bush hogs. With a twist of logic I did not grasp, I went to Cedar Grove Cemetery. In that era, digging graves was accomplished by hand. When not digging graves, mowing and trimming the 35 acres was the bulk of our work. The two permanent workers, “Mister Bill” and “Dub” (I apologize for not knowing their last names. I’m not sure I ever did) took me under wing. They were pleasant, interesting, and fun. Mr. Mitchell “Bush” Babb, the manager, lived adjacent to the cemetery. He reputedly was the only one who knew the grave locations after a fire destroyed some cemetery records. I was impressed Mr. Babb. had played against Ty Cobb in the Tennessee-Alabama League before the Georgia Peach went on to fame in the majors. Once I got over my queasiness, I found the cemetery interesting. I studied grave markers, especially the older ones. The Mitchell-Smith monument was impressive. My father had told me about the huge granite slab’s (roughly four by six by eight feet) trip to its final resting spot. He was “seven or eight” when the monument arrived at the train depot where Shenandoah Mills now stands. He snuck away to watch part of the two-week process. After offloading from the flatbed, the monument was set on four wooden logs, roughly a foot square. The logs were slicked with “octagon” soap. The four horses or mules pulled the monument forward while the workers rotated the logs from back to front. There were many other interesting stories I gathered from the markers. Sonny Smithson, a seminary student at David Lipscomb joined me the next summer. His father was the preacher at the College Street Church of Christ when it was actually located on the corner of College Street and Gay Street. Ironically, the original city cemetery was located there and until the interred were relocated to Cedar Grove when it opened in 1846. In 1962, our last summer, Sonny and I became efficient in cemetery work and learned about graves “sinking.” Some sunk immediately after the burial due to the dirt compacting. Others sunk later when the natural decay set in, especially in the older graves, some suddenly when an air pocket collapsed. We tread over the grounds without temerity. One June day, Mr. Bill sent us to clear out an area in the northwest corner. As normal, we had gathered for the day’s work at the small stone building in the opposite corner..
With “lively lads” on our shoulders, we trekked across the cemetery on the shortest route: pretty much a straight line, walking over graves with no concern. I was in the lead. Just after I walked over a grave (we later determined the grave was created in 1923), I turned to say something to Sonny. As he stepped on the middle of the grave, one of those air pockets took the opportune moment to collapse. Sonny went down into the depression about two feet and turned ashen through a Tennessee summer tan. He cleared what seemed to be about six feet straight up. Before he hit the ground, we realized what had happened. But for a split second, graveyard ghost stories came rushing back to both of us. Sonny left work early that summer to go back to the seminary. I am sure it had nothing to do with the sinking grave incident. I worked through the rest of the summer. Now when I have to submit a resume or biographical summary, I include “gravedigger” as part of my experience. It has proven to separate me from the pack, and I always know when someone has read my input in its entirety. i’ve been posting all sorts of stuff about all sorts of things here on this website for some time now. That is me enjoying me, but i kept feeling like i was missing something that once was here. In case you haven’t noticed, i love to write. Consequently, i can just go bananas and forget some things i meant to always be a part of this column, like an extension of writing “Notes from the Southwest Corner” as a weekly column for The Lebanon Democrat just shy of ten years. Then for the last several days, Tick Bryan’s post on the “If You Grew Up in Lebanon, You Remember…” of the Tastee Freeze shop made me realize what has been missing here: memories of Lebanon, Tennessee. An integral part of my memories, was, of course, four years at Castle Heights. Although i did okay in Academics and so-so in the military side (ironic, isn’t it? ), my focus was on sports. Sports dominated my thoughts (okay, okay, girls were pretty high in those thoughts as well) from when i can remember until i realized i wasn’t going to play any sport at the intercollegiate level. Football was my driver. The below is a column, i wrote for The Democrat in 2008 about those memories about football and Lebanon. 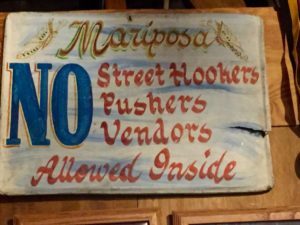 SAN DIEGO – On my second birthday, after my father returned from the war, my uncle, Alvin “Snooks” Hall, gave me a football. 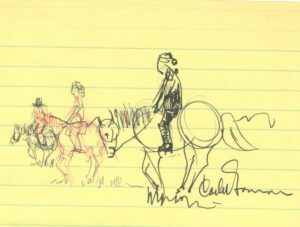 In my mother’s albums, there is a snapshot of me at four in my cowboy hat standing beside a little red wagon. In the middle of the wagon bed is the football. Even though I played other sports, football was my passion. I played imaginary games in the yard. On Saturdays, I could hear the Castle Heights announcer calling the Saturday afternoon games. I was Doak Walker, the Heisman award winner from Southern Methodist University; the triple threat star Bob Waterfield of the Los Angeles Rams, who was also married to Jane Russell (my aspirations were high); and Bobby Lane, the feisty quarterback of the Pittsburgh Steelers. My father took me to the Lebanon High games at the juncture of Fairfield Avenue, South Greenwood Street, and East High Street, urging me to scream the entire game. We would watch the Sunday games on the black and white television. Red Grange, the “Galloping Ghost.” announced the games. On the radio, I listened to the Commodores and the Vols as well as the Tennessee Tech and Middle Tennessee Thanksgiving games. Occasionally, we would go to Nashville and watch Vanderbilt play at Dudley Field. At Lebanon Junior High, I played two years with one loss in 16 games. It was my acme in football. but I continued to play with some notoriety as “Mighty Mouse” at Castle Heights (Mike Dixon, The Cavalier sports editor gave me that moniker) while my friends were having the Blue Devil magic undefeated season in 1961. As a junior, five-six, 135 pounds, I incongruously played blocking back and linebacker. We traveled to Baylor, just outside of Chattanooga for an afternoon game. My aunt and uncle, who lived there, arrived at half-time. I suspect Coach Jimmy Allen saw them waving to me. Regardless, I was sent in on defense in the third quarter. A signal from the sidelines directed us from our normal “6-2” defense into a “7-1” alignment, seven down linemen and one linebacker. Using the same reasoning which got me in trouble most of my life, I volunteered and stepped into a defensive guard position. I split their right guard and tackle. Both were all-conference for two years. The guard weighed 240 pounds, the tackle topped off at 265. I think I saw the quarterback licking his lips. 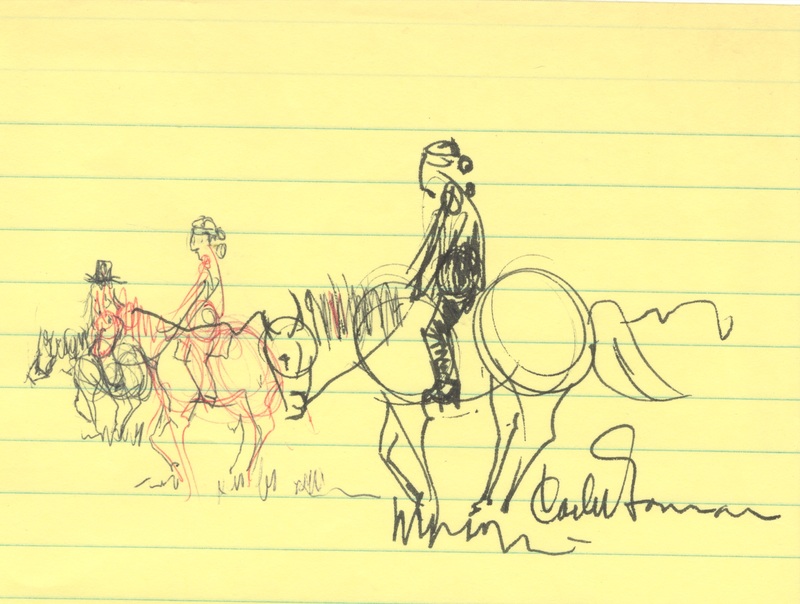 As he called an audible, I rationally concluded they were going to run straight at me, deciding my only chance was to “submarine.” That meant I would dive low and hopefully split through the two mammoths in front of me. Good idea. Unfortunately, the two giants in front of me also figured that out. They double- flopped on me, trapping me under more than 500 pounds of flesh and gear. I was spread eagle on the ground. I squirmed and waved my arms as much as I could to breathe and to get the lummoxes off. The halfback cut next to the massive pile with this puny linebacker underneath. As he cut, he tripped over my frantically waving left hand, falling forward for a one-yard gain. As I retreated to the sideline, teammates pounded me on the back. Reaching the sideline, Coach Frank North rubbed my helmet. I could see my aunt and uncle smiling and cheering. Yesterday, the San Diego Chargers played the Indianapolis Colts. As I write, the game has yet to be played. Amidst the hoopla, gauntlet of commercials, and incessant inane analysis, there will be some good football played. The playoff game was in a dome, filled with fanatic, costumed crazies whooping as much to get on camera as to root for their team. The majority of the players far outweighed the two behemoths who flattened me 47 years ago. There will be more coaches and staff for each team than the players we had on the 1960 Tigers. The game was played in mid-January. I will think how much more fun it was to get crunched by offensive linemen on a perfect autumn afternoon with a sparse crowd in Tennessee than it will have been watching the NFL extravaganza. This is my Democrat column i mentioned in my previous post from 2008. The following summer I hoped to drive a bush hog tractor but was told I was too small. My big friends, Henry Harding, Charles “Fox” Dedman, and others were assigned the bush hogs. With a twist of logic I did not grasp, I went to work at Cedar Grove Cemetery digging graves. A small guy’s work?